It was fun to meet up with the Red Shed Girls at the Bonanza. It's always nice to run into some homies when one is away from home. They were in town to buy of course, but also to scout locations for next year's package trip. On Friday I tagged along (I promised not to slow them down) and we headed for the outskirts. They had been asking questions and doing research to find some fun places to explore. I had been told about a nifty thing we might find at Menards. You see we don't have a Menards down here. So when we passed one we stopped to see what it was all about. I think Michelle was in love with the fact that they have food in there. I think she said something like "This is the only place I'd need to shop if we had them in TX"
We also were lucky enough to get a box from their warehouse that was just perfect for the treasures they had to ship home. One of the first places we went to was Haupt Antiek Market. Deb Haupt was selling at the bonanza so we had already gotten an introduction to her goodies. Not sure if I saw this at "Haupt" or at the next place "A Cat and the Fiddle Afair"
Look at this unique bowl, It's made from a roll of Admit One Tickets. I have no idea how to do it, but what a fun thing to try. Fun stuff in each house, and sometimes a little spooky too. Love the fact that many of these stores have basement areas as well. Again, we don't have that in TX. I loved this outdoor display. I saw several of these washer ringers while in MN. they must have loved doing their washing. We also visited the Cottage House, they had already been having their sale for several days, so we missed a lot of the good stuff. I like the thing below and I think it would make a great headboard for a twin bed. But it was too big to ship. Of course we took a side detour for some Garage Sales. You can read more about this Friday adventure on their blog here. Thanks Val and Michelle for letting me tag along. I'm going to take a break from the adventures to show you what I got. I didn't get all of this at the Bonanza but I got most of it there. I've updated RoboJunker.com with a special Bonanza Issue. If you've never visited RoboJunker.com, pop on over and see what is happening. As you can see my trunk was filling up, and by day 5 I decided it was time to get a box and just see if it could all be packed to be shipped back home. This is box #1, you can't really see what all is in there. I nested, and filled every empty drawer and spot I could. Each of these boxes ended up weighing just over 50lbs. Box #2, half full, I filled up the empty spaces with my dirty clothes to add padding. The boxes arrived last week, and nothing was damaged. Most of the items above came back with me in my luggage. And yes my luggage was searched. I think those TSA workers were a little baffled. More smalls I stowed away in my luggage. I just love little metal tags. My roommate gave me the Paris tags, Thank you Heather. I love store displays, and look at that double livestock waterer I found at the Medina Flea Market. I'm doing the Window display at Winnie & Tulula's in October, and I purchased lots of fall colored items for that display. Love the blanket in this picture and it will be perfect for the Window. I found this great chippy pink shelf at the Medina Flea Market, Sunday Morning. Love this yellow display. After I bought it, I left it at the booth. In my mind it's size began to grow and I was wondering why I purchased something so large. Then I saw it again, and realized it was the perfect, shippable size. It fit perfectly in the bottom of the first box. Stay tuned for more of my travels, We aren't done yet. I did more shopping in addition to the Bonanza, and tomorrow we begin to travel. There was no shortage of parties and get togethers at this year's Junk Bonanza. When I told folks where I was going, I simply told them it was a junker's convention of sorts. That seems to satisfy their curiosity. Actually it is very much like a convention. Folks from all over, converge at this one spot to shop and socialize. And socialize we did. Lots of people took a break from the shopping to come out and visit. I met Beth Madison of Green Cricket Salvage and loved her film earrings. Ki's friend Kathie was the gal in charge of hospitality and she was one busy gal. 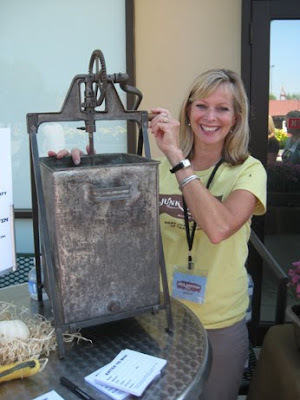 Here she is manning the drawing hopper, and guess what is used as the hopper? An old butter churn of course, what else would one use as a drawing hopper. I actually won an item, and it was the one item I really wanted to win. It was the latest copy of Where Women Create, Signed by Jo herself. Kathie also had a party at her home on Thursay evening for many of Ki's out of town guests. Kathie has a beautiful home that has no shortage of junky stuff. Good junky stuff. See that screened porch, that is actually a little guest house in the back yard. The whole thing was beautiful and she was so sweet to open her home to everyone. Below Ki's daughter tells stories of Hollywood life. Seen on the very far left is Emily, Ki's assistant and Right hand gal. As you can see it was quite the social event of the junking season, and I'm so glad I could be a part of it. More junk next post, including pics of my purchases. BTW: Ki is keeping a list of bloggers who've made posts about the Bonanza. Be sure to pop over to her blog to read more about this wonderful show. You can leave a comment on her blog to have yours added to the list. Thursday morning came and it was time to get shopping!!!!! Below is Gretchen of Mimi-Toria's. Gretchen specializes in jewelry, and was so nice to give me a great necklace with a Greyhound on it. For those who don't know. My husband and I have adopted 3 retired racing greyhounds. They are the best dogs. Thank you so much Gretchen, this will always be a special piece for me. Gretchen shared a space wit h Lani of Cottage Elements. There were 3 or 4 ladies in this space, and they were the second on the left when you walked in the tent. They were busy busy all week. The candle holders above were made by Lori of Whistle Stop. Can you tell what they are made of? They are old gutter cages. Great project Lori, thanks for letting me share it. Ki and her sister and daughter worked into the night to make the Junk Revolution store beautiful. Look at all those t-shirts. Remember I folded most of them. And that's only the guys shirts. 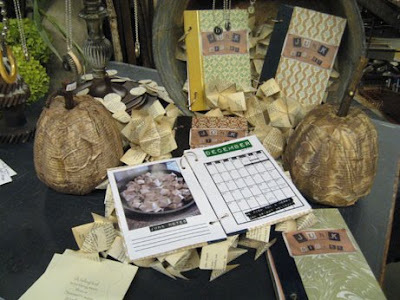 The Shops of Carver put together these wonderful junk journals Designed by Liana Dresselhaus. I'm sure you'll be seeing these in more detail in the future. But for now let me say that Jane told me I was the inspiration for this project. Remember the Junk Calendar from last year? Well each month of the book has great junk pictures taken by the ladies. I love seeing how projects morph and change with each new creative person. These were given away in the early bird bags and were also available for purchase. See those wonderful pumpkins. That's another Project Alert for you. I'm working on making some for myself for some Fall Displays at my mall spaces. They were made by Sara Smith of Seasons in Carver. The stem is a branch and look at those cute springs coming out near the stems. Decopage Glue, here I come. Amy of Whisperwood Cottage was nice enough to give me one of her iJunk Tshirts. Thank you Amy, I just love it. there was no shortage of the odd and unusual junk items at this show. And there was so much I couldn't take home with me. What is it??? I think it said it was a washing machine agitator. Mounted on top of a tri-pod. We gathered together later in the day, and caught Nancy Soriano busy organizing her purchases for shipment. Ki had arranged for a shipper to come by every day at 4:00 and he would take care of shipping your purchases for you. I just love that bag Nancy picked up. Project Alert: It's made from one of those old linen calendar towels that we've all seen before. Looks like Heather likes it too. 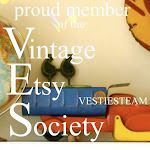 Tomorrow the Blog Party, more pretty displays, and several more project alerts.